1895 photo by George H. Craig NSARM acc. no. 1988-387, NSARM neg. N-728. Many of the black recruits and families that took advantage of the British offer were eventually resettled in Halifax, Nova Scotia. According to Taylor, around 1,200 black refugees arrived between 1813 and 1814 and another 1,611 refugees arrived between April 1815 and October 1818. Among the enslaved people from the Chesapeake who made it to Canada was thirteen-year-old Gabriel Hall (pictured above in an 1895 photograph) who escaped from Walter Wells’s Calvert County farm in July 1814. Learn more about Gabriel Hall from the Maryland State Archives or read on for a transcript of Cochrane’s proclamation. 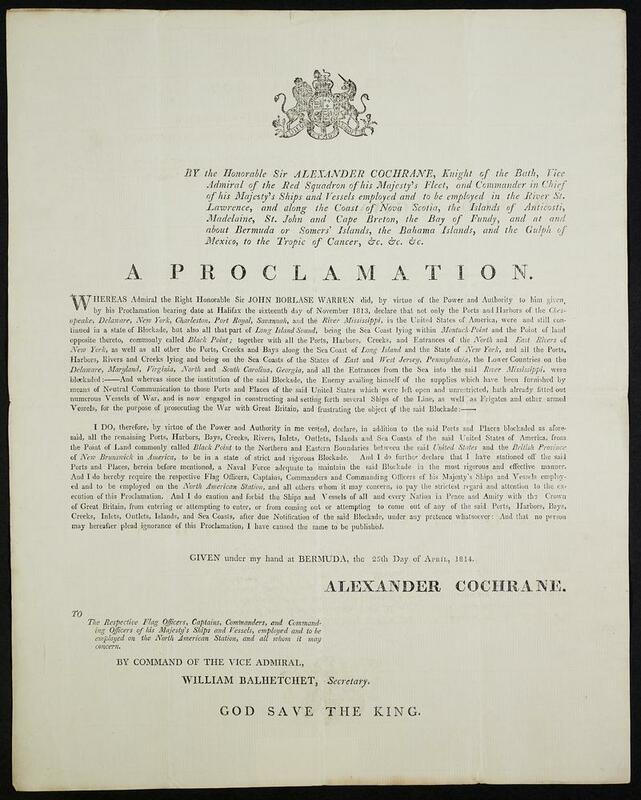 PROCLAMATION OF VICE ADMIRAL SIR ALEXANDER F.I. COCHRANE, R.N. By the Honorable Sir ALEXANDER COCHRANE, K.B. Vice Admiral of the Red, and Commander in Chief of His Majesty’s Ships and Vessels, upon the North American Station …. &c, &c, &c.
WHEREAS, it has been represented to me, that many Persons now resident in the UNITED STATES, have expressed a desire to withdraw therefrom, with a view of entering into His Majesty’s Service, or of being received as Free Settlers into some of His Majesty’s Colonies. That all those who may be disposed to emigrate from the UNITED STATES will, with their Families, be received on board His Majesty’s Ships or Vessels of War, or at the Military Posts that may be established, upon or near the Coast of the UNITED STATES, when they will have their choice of either entering into His Majesty’s Sea or Land Forces, or of being sent as FREE settlers to the British Possessions in North America or the West Indies, where they will meet with due encouragement. Given under my Hand at Bermuda, this 2nd day of April, 1814, ALEXANDER COCHRANE. By Command of the Vice Admiral, WILLIAM BALHETCHET. GOD SAVE THE KING.